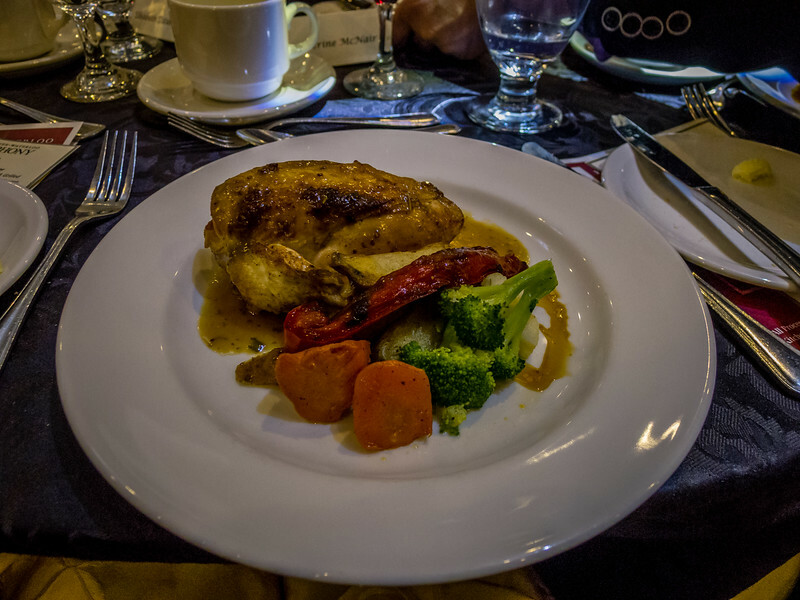 When we arrived at the KW Symphony’s gala fundraising dinner, we immediately noticed a glamorous-looking woman in a shimmery dress with a long train that we made a mental note not to step on. Next thing we knew, after getting a drink from the bar, she was introducing herself to us. I’m Patricia Ward Kelly. Gene Kelly’s wife. That would be Gene Kelly, actor, dancer, director, and star of Singin’ in the Rain, the greatest musical of all time. And no, Ms. Kelly is not 90 years old; she’s maybe 50? “Big age difference when they met,” I told Jean, after we’d thanked her for talking to us and moved off into the next room. He was a bit stunned, not having read about Patricia Kelly in advance, as I had. We weren’t able to convince any of our friends to join us at this affair, though, so we were seated with three other couples we didn’t know. (Should have been four, but one set was a no-show.) They proved to be good company. We had interesting conversations on topics such as travel, books, and Future Shop (which had suddenly closed that morning). The event was held in the ballroom of the Crown Plaza Hotel (so, far from the pool smell…). Cocktails started at 4:30, dinner at 5:30, and they did an exemplary job of getting through speeches, an auction, and the three-course meal in time for us to get to Centre in the Square for the show. As for the food, I think everyone was happy with the salad appetizer and the dessert, which was a choice of carrot or chocolate truffle cake. For the entree, I overheard some complaints of it being cold or the meat tough. Maybe just luck of the draw, then, but Jean and I found our meals quite fine. For the auction, it was interesting that bidding was fiercest for the items that were essentially donations: for sending a school to a concert or for the symphony’s music therapy program. Instead of just taking the largest bids, Patricia Ward Kelly suggested accepting all the highest bids as multiple donations. Good idea! She herself was quite a good speaker, talking of her meeting with Gene Kelly, when she didn’t know who the heck he was, and how they fell in love, and she’s become the keeper of his legacy. She’s never remarried. She was also very gracious about the community and the symphony organization. The final part of the evening was at Centre in the Square (taxi ride to and from included), where Singin’ in the Rain was played with a voice-only soundtrack, and the KW Symphony played all the music live. Ms. Kelly spoke briefly here as well, and one of the items she told us was that all the original scores were thrown out by the studio, and had to be re-created later, by ear. Evan Mitchell came back from Kingston to do the conducting of this show, and he did an amazing job of keeping the symphony in sync with film being shown. All really seamless, except for occasionally hearing the musicians turn the pages! Jean concluded he hadn’t ever seen the entire movie before. For me, it was certainly the first time I’d seen it on the big screen. It’s so good! And for once, it totally made sense to applaud in the middle and at the end of a movie. After the performance there was another reception downstairs, in the fancy member’s lounge. While it was nice to be in that room again (and get more desserts! ), it wasn’t a terribly entertaining event, so we didn’t stay too long. We ended up cabbing back to the Crown Plaza with the Assistant Conductor of the KW Symphony. Singin’ in the Rain plays again tonight (without all the gala accoutrements). 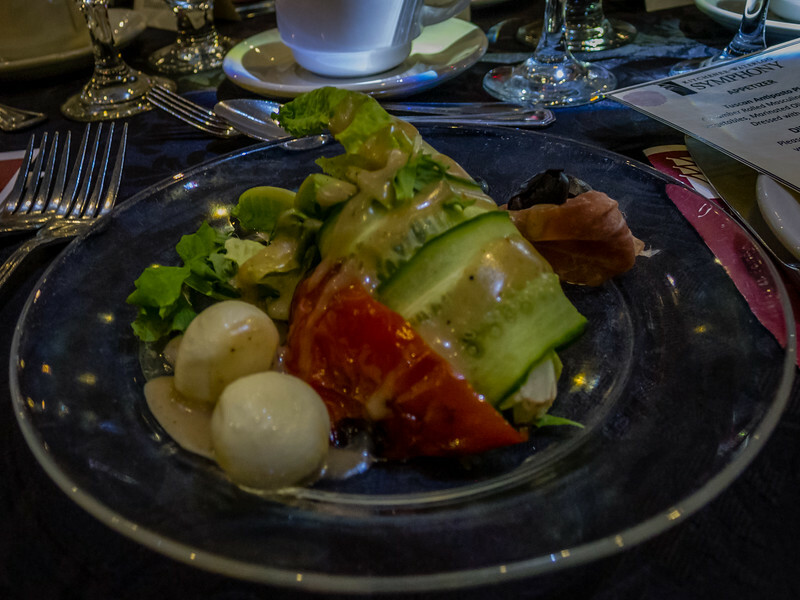 Categories: Arts, Music | Tags: food, KW Symphony, live music, movies, photography, Waterloo | Permalink. I didn’t know about Debby’s voice being dubbed!